Plant root stimulator that uses a unique blend of natural minerals to increase the length and mass of a plants root system in order to give it more access to water and nutrients. Can also be used on cuttings or seedlings to encourage strong new growth. Grow longer stronger roots even in dry soil. Every gardener knows longer roots mean stronger plants, if you didn’t know that, we feel you should do. Envii Deep Rooter is the easiest way to give nature a helping hand. The application of Deep Rooter stimulates the plant to grow longer, stronger, wider-spread roots capable of accessing more nutrients and water even when they are deeper in the soil. 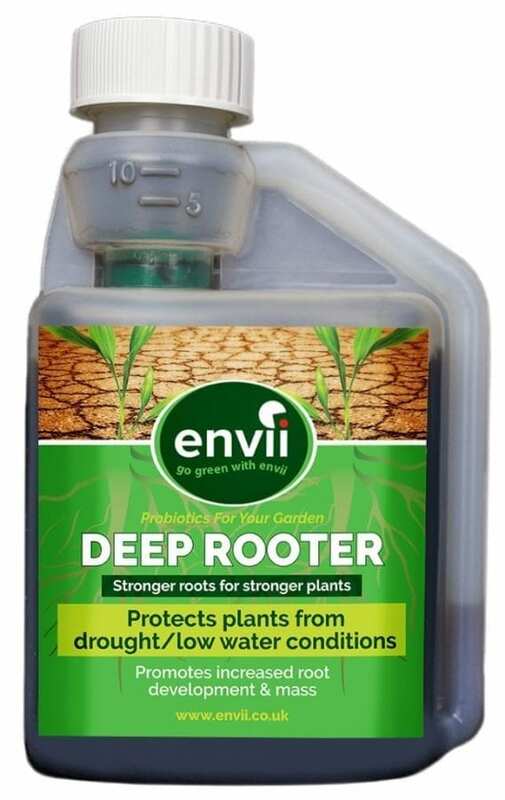 Envii Deep Rooter combines a sophisticated blend of natural plant extracts and nutrients which give proven results and protect plants from droughts. 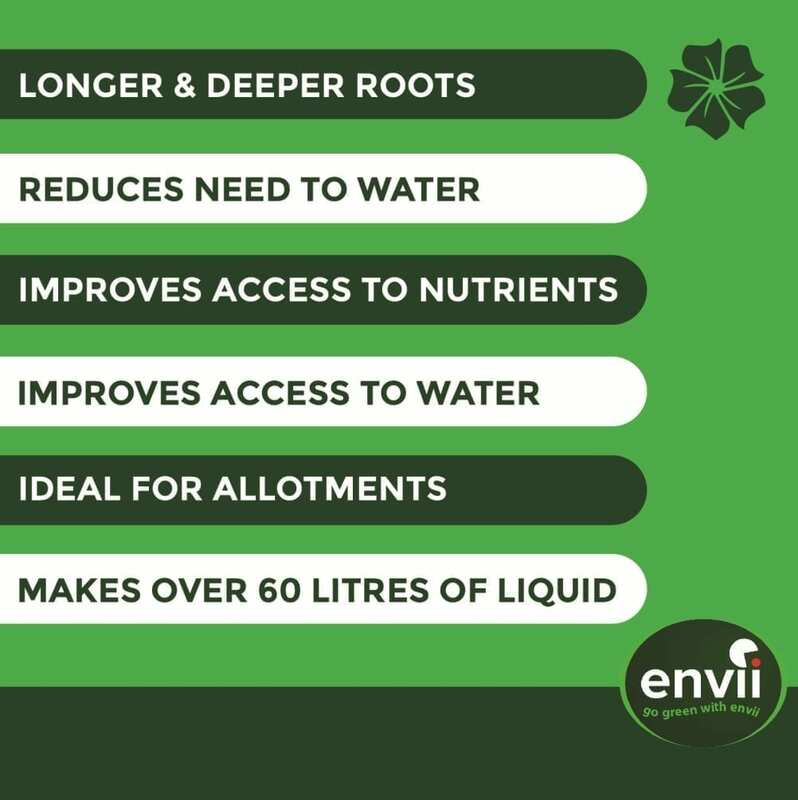 One reason that Envii Deep Rooter is growing in popularity amongst top gardeners is the resilience it brings to plants during extended periods of heat or when there is a drought. In areas where it may be hard to water plants regularly, such as allotments, the deeper roots allow them to access water that may normally be out of reach. This makes them more resilient to dry spells and protects them from droughts. Sometimes too much water can also be a problem. Heavy rain fall can often dilute or wash away soil nutrients near the surface. The root growth driven by Deep Rooter allows the plant to access the nutrients normally out of reach. Some gardeners resign themselves to the fact that some plants will never grow in their garden due to soil conditions. Deep Rooter is ideal for soil which tends to drain quickly, such as sandy soil. Treated plants have a better chance of absorbing the moisture and nutrients before they drain away. Deep Rooter facilitates the storage of carbohydrates and sugars; and trials at a leading University demonstrate that it is also particularly effective in aiding the plants uptake of phosphorous & sulphur. The perfect alternative to rooting hormone powder or mycorrhizal fungi. – Stronger roots make stronger plants. Apply every 14 days throughout the growing season for best results! Dilute 20ml per 5 litres of water and apply to base of the plant. Begin using Deep Rooter when plants have developed their first three leaves. Are there any plants that this can't be used on? No, Deep Rooter can be used on all plants. Can this be used on cuttings? Yes, Deep Rooter is great at stimulating root growth within cuttings. How often should I use this? We recommend using Deep Rooter once a week. Organic slug control method that uses diatomaceous earth to naturally protect plants from slugs, snails and other small pests. Also contains iron silicates to improve soil fertility and maximise plant growth. Natural bacterial treatment to repair grass that has been damaged by dog urine. The bacteria break down the nitrogen found in urine to repair lawn burn patches, improve grass growth and prevent urine from burning the grass in the future. This is a unique slug deterrent method that slightly alters the taste of a plants foliage in order to deter slugs (this taste is undetectable to humans). Also contains a blend of essential micro-nutrients to improve plant growth.